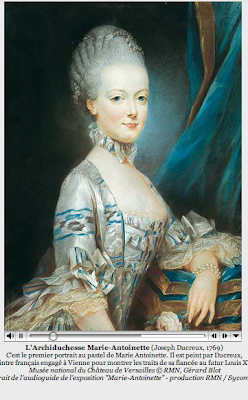 There's a big show at Versailles about Marie Antoinette right now. How relevant. I got this picture from the site. It was one of the pictures made to send to France to show them how beautiful she was and how she was the "one" for the Dauphin. She sure was! Kitty's concert last night was a great success complete with music derived from video games that was monumental and stirring.We had dinner with the rest of the fam...after. Thank goodness for the cool weather. One such concert had kids literally falling off the risers with heat strokes and fainting. That was a painful and scarey show...but they never stopped which still puzzles me. Sent a note to Betsy and Ted Lewin about my children's book--as I was sure I was (as usual) off track with a lovely response saying it was fine to go...so I am psyched. Need to get some reference going as I am pumped as it will be fun. The plans are to do a book on color that is chock full of things having to do with the color teaching about butterflies, bugs, animals, reptiles, birds, fruit, flowers, and anything else that works. It will be a little discovery book...that is still unclear about style...but hey...that is where the challenge is. Maybe handdrawn? Maybe vector mania. Need to go. My new optometrist and bifocals await. Ah, Age!